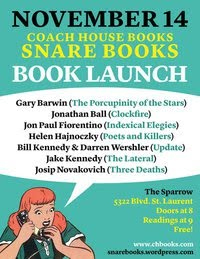 I'm thrilled to be part of this fantastic line-up of writers and their new books. Pearl Pirie in Ottawa keeps up an interesting array of blogs. Her Pesbo blog is about poetry-related things. I make a point to read it because she is earnest, insightful, often points me to think in ways that I don't usually, and, all her work is infused with compassion, curiosity, discovery, and inquiry. Pearl is also an interesting poet. Her new book, been shed bore, has a beautiful website. Her work reflects what I said above about her blog: it is infused with compassion, curiosity, discovery, and inquiry, to which I should add play and a great ear for the musical possibilities of language. Yesterday, Pearl published a round-up of recently 'dipped-into' poetry books, a brief discussion of several books and specific poems, often focussed around loss. The poets she considers are: Kay Ryan, nathalie stephens, Sandra Ridley, Bernadette Wagner, Susan Stenson, Susan Musgrave, John Lent, Dani Couture, and me. I certainly appreciate her thoughtful discussion of how my poem, Brick, works through its imagery, thought-structure, and language. Stuart Ross has just won the ReLit prize for short fiction for his fantastic book, Buying Cigarettes for the Dog. I think Stuart is one of Canada's best writers-- compassionate, existential, funny, bittersweet, metaphysical, socially insightful and satirical, and deeply concerned with how to navigate the ontological poodles of the modern world. I'm glad with this award, his latest book received at least some of the recognition that it deserves.